A fire detector is essential in any home or business. But when it comes to fire safety and prevention, it’s only one step in the right direction. Taking a few measures toward fire prevention in your home or business protects your home and family, or work space and employees. Read on for our room-by-room guidelines. Some may seem obvious, but believe us, it’s easy to forget about fire safety when life gets busy. Cooking fires are the leading cause of all home fires and injuries. Multitasking is a part of our lives, but be sure to keep your focus in the kitchen. Never leave an open flame unattended stove-top. Keep flammable items including oven mitts and food packaging away from heat sources. Set a timer to remind you when something needs to come out of the oven. Make sure your work spaces are free of grease and other debris that could catch fire. 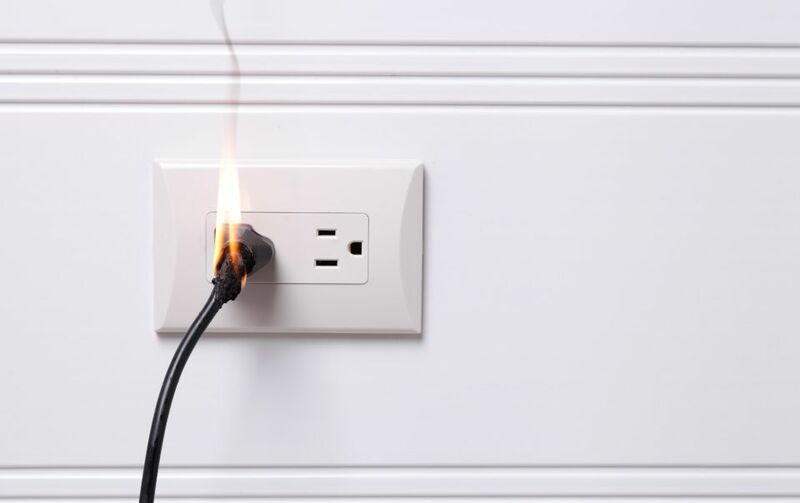 Avoid overloading your outlets, or maxing-out an extension cord. This can cause overheating and spark an electrical fire. Don’t run cords or cables under carpeting. This puts them at risk of being frayed or damaged, which makes them a fire hazard. Keep lamps and night-lights away from bedding, curtains, clothing, and other fabric. Blow out candles before dozing off, or leaving the room. Keep candles, lighting, and other heat sources away from oxygen tanks, if it is used, since oxygen can be explosive. Keep hair dryers, straighteners, electric shavers, and other appliances away from sinks, tubs, and toilets. Don’t ignore blown fuses, a sign that you could be overburdening a particular outlet. Have an electrician ensure that the outlet is equipped to meet your needs. Replace appliances with frayed or damaged wires — they can put you at risk for shock or fire. Keep light fixtures covered to prevent damage or breakdown that can lead to fire. If you keep candles in the bathroom, be sure to keep matches and lighters out of children’s reach (or, better yet, ditch the candles entirely). Keep flammable or combustible objects at least three feet from space heaters, and never keep a space heater somewhere it could be knocked over by passersby. Pay attention to flickering lights. They often signify a greater electrical problem, and should be inspected by a licensed electrician. Insist that smokers take their cigarettes outside, and properly dispose of their cigarettes in sand or water. Make family or coworkers aware of your fire exit plan, in case of emergency. Keep spark screens in front of fireplaces, and never leave a fire unattended. Enjoy the peace of mind that comes with knowing you’re well-protected. If you need assistance keeping your home or business fire safe, we’re always here to help.